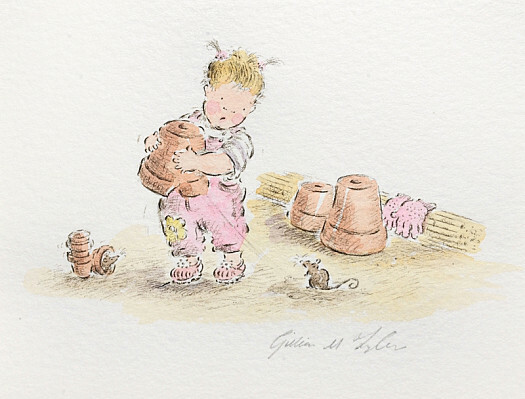 Gillian Tyler began her career as a wildlife artist and etcher, but turned to illustrating children’s books when she realised that bringing characters from stories to life was what she really enjoyed. She has illustrated books for Allan Ahlberg, and is now embarking upon a new project to accompany a text by Michael Rosen. Born in Mexborough, South Yorkshire, on 3 January 1963, Gillian Tyler grew up in the village of Thurnscoe, in the heart of a coal-mining district. Unlike the rest of the men in her family, who were all coal miners, her father had trained as an electrical engineer in the army, and rose to the position of chief engineer within the Yorkshire Electricity Board. Her mother trained as a medical secretary but gave this up to look after her four daughters. 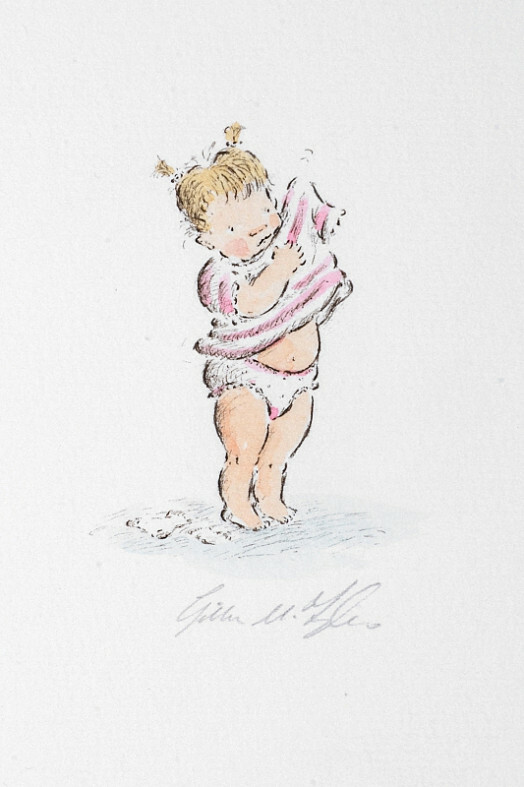 Gillian is the second eldest of the four sisters, who were all ‘obsessive about making things’; she remembers writing and illustrating her own books, putting on plays, and making their own clothes. Since her grandmother had been both a seamstress and a milliner, their home was always full of resources for Gillian to use, and she was both industrious and prolific in her creations from a very young age. 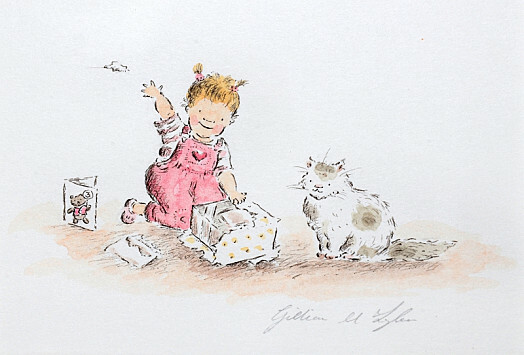 As a child, Gillian was fascinated by nature and collected various wild animals from the surrounding fields, filling the house with baby hares, birds, mice and caterpillars, and making these animals the subject of her paintings. 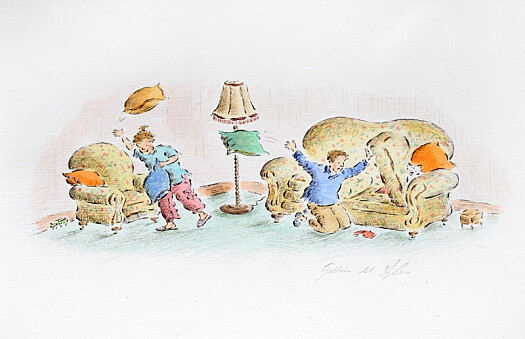 She also read many illustrated storybooks during this time, and particularly remembers being enthralled by Ardizzone’s illustrations for Clive King’s Stig of the Dump (1965). The first book that she bought, and remains influenced by today, was Kathryn Jackson’s Autumn Tales (1955), illustrated by Richard Scarry, which she purchased for sixpence on a trip to Blackpool. Gillian attended Houghton Road Infant School, where she recalls that ‘instead of pencils, there were always jars of scratchy pen nibs and brightly coloured inks’ on the tables for them to use, which she loved. Her interest in art was further encouraged at Gooseacre Junior School. Thanks to some very enlightened teachers, the pupils were allowed complete autonomy in designing and decorating the school hall for each season. It was around this time that Gillian’s aunt entered a painting of a robin that Gillian had made into a competition at the Doncaster Arts Festival, and she won first prize. The £5 prize money was immediately spent on her first set of brushes and her very own supply of precious watercolour paper. In 1979, Gillian began her studies at the local comprehensive school, and immediately gravitated towards the art department. Her art teacher, Mr Owen, was a profound influence and encouraged her to believe, for the first time, that she could carve a career as an artist. On gaining her A Levels at Barnsley Sixth Form College, she began a foundation course at Barnsley Art College, which she completed in 1981. During this foundation year, her interest in the natural world and illustration merged and she was introduced to the work of Thomas Bewick and C F Tunnicliffe. She taught herself taxidermy, and would draw from birds that she had stuffed in class. Gillian gained a place to study Illustration at Manchester Polytechnic in 1981, where she took a particular interest in wildlife illustration. During her final year at Manchester, Gillian broke her drawing arm and, in her frustration at not being able to paint properly, taught herself to draw with her left hand. 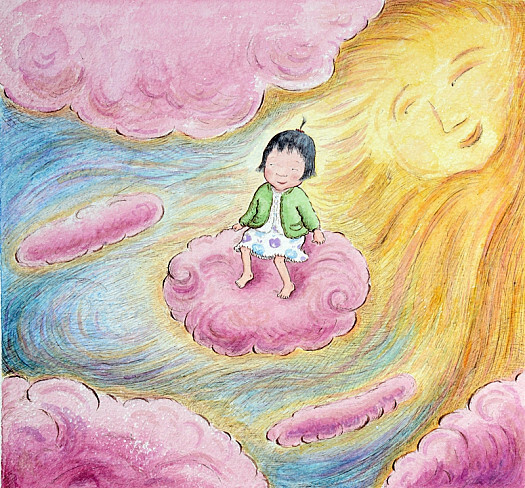 She found herself returning to the scratchy pen drawings of her childhood, and illustrated children’s stories to pass the time. It marked a turning point in her development, as she discovered that she greatly enjoyed bringing these literary characters to life. Gillian remained in Manchester after she graduated in 1985, and became a freelance illustrator. She took on as much work as possible, as a wildlife illustrator, from local agencies and publishers. Amongst other commissions, she produced a series of miniature etchings depicting rare breeds of animals for the Manchester Etching Workshop. 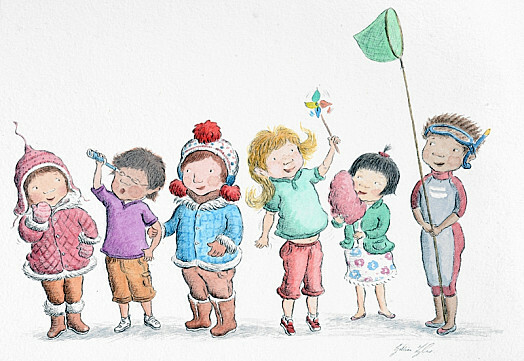 She supplemented her income with part time work at the local library in Didsbury, and at home she indulged her secret passion for illustrating children’s books, as she began to build a portfolio for this entirely different body of work. 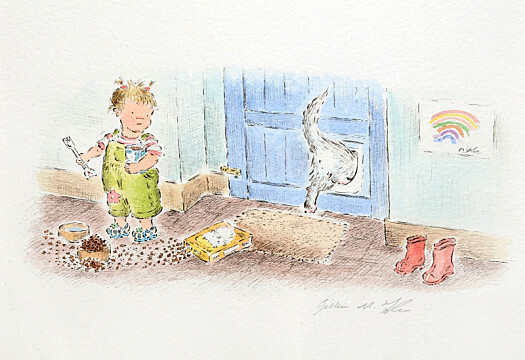 In 1989, Gillian returned to Penistone in Yorkshire, but continued to make regular visits to London with her portfolio of illustrations. When the newly established publisher, Walker Books, noticed Gillian’s work, she was ecstatic. 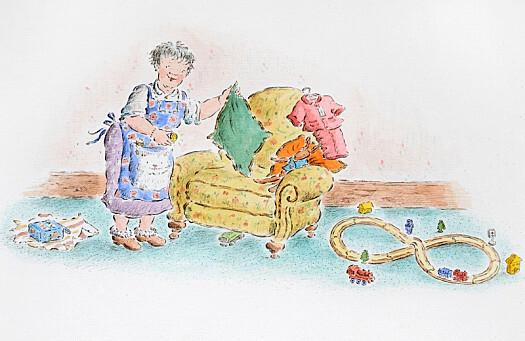 Her first illustrated children’s book, The Good Little Christmas Tree, was published in 1991. In 1996, Walker Books informed her that Allan Ahlberg was interested in her work. He asked her to illustrate The Snail House (2000), a story about three children who had shrunk and made a home in a snail’s shell. The book was the winner of the 2001 British Book Design and Production Award. 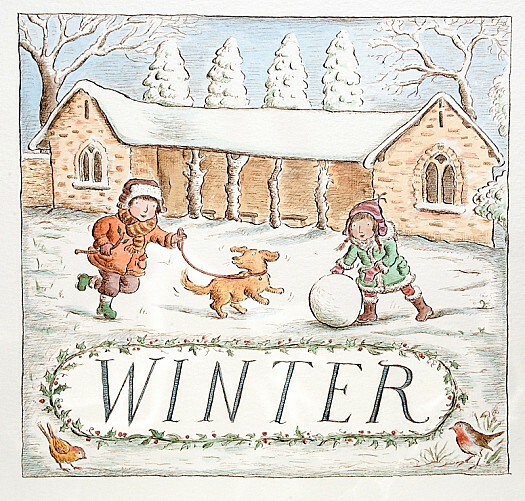 She collaborated once again with Allan Ahlberg, when she illustrated Treasure Hunt (2002) and this publication was swiftly followed by the sixteenth-century English ballad, Froggy Went A-Courtin’ (2005). 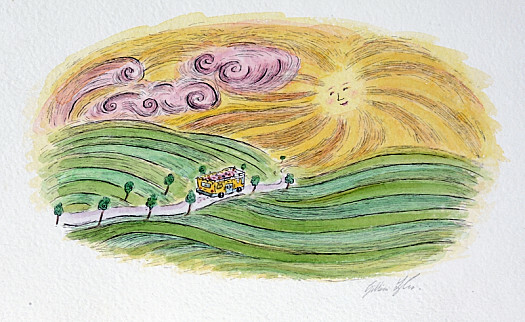 She finds inspiration in her surroundings: both the Yorkshire people and the countryside. She drew heavily from her experiences of the local country fair, the Penistone Show, when illustrating Dori Chaconas’s Hurry Down to Derry Fair (2011). 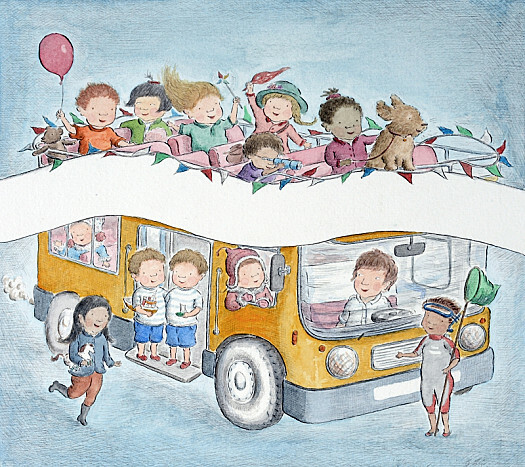 Gillian continues to illustrate children’s books, as is demonstrated by her recent collaboration with Michael Rosen, The Bus is for Us! (2015). She lives near Penistone with her husband, Darrell, and is mother to two boys. She has a studio in her local town, where she works accompanied by her faithful dog, Hector. Best Is the Bus. the Bus Is For Us.